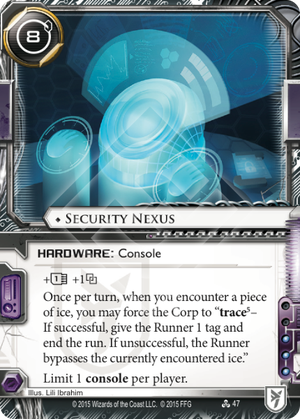 Once per turn, when you encounter a piece of ice, you may force the Corp to "trace – If successful, give the Runner 1 tag and end the run. If unsuccessful, the Runner bypasses the currently encountered ice." Let us start off with comparing this to Dyson Mem Chip. Both these cards give you 1 and 1. This means you are spending 5 on Security Nexus's ability. Bypass ICE. If you can beat a strength 5 trace, you can get past whichever one piece of ICE you want. Being Sunny Lebeau: Security Specialist and running this card gives you at least 3. So you have to pay at most two more than the Corp to bypass the ICE. Immune to nasty ICE effects. If you hit an unexcepted piece of ICE or are running through Jak Sinclair's ability, you either bypass the ICE or end the run and take a tag. This can turn hitting a Janus 1.0 on a Jak Sinclair run into any other runner facechecking a Datapike. This is because even if the Corp boosts the trace and wins, you will take a tag and immediately end the run - no subroutines fire. All you do is spend your first actual click and 2 to remove the tag. Expensive. You want to get this out as early as possible to use it as much as you can. However, 8 early game will set you back 2 to 3 turns. Considering Sunny Lebeau: Security Specialist has expensive breakers as well, it can give the Corp too big of a window to score. Caprice Nisei. You can bypass a piece of ICE but if you lose the psi game, you will have to get past the ICE the old-fashioned way. But then again, which runner is not affected by this line of play by the Corp.
Surveillance Sweep. If you are forced to pay for the trace first then the Corp is paying a minimum amount to end the run and give you a tag. Jak Sinclair. Since Security Nexus is not a program, you can still use it to bypass an ICE on a Jak Sinclair run. High . If you can add even more link then you are only going to increase Security Nexus's power. Rabbit Hole and Access to Globalsec are common ways to do this. Power Tap. By itself this card may as well just be another link because getting one credit for the trace and pay one extra is the same as paying one less to begin with. However, if you are boosting your base link or "would be doing it anyway" then you are getting ahead economically. Power Tap can then be turned into more drip econ as you can guarantee a trace each turn with Security Nexus. And it only gets better whenever the Corp has cards to initiate a trace. This console has an undeniably powerful ability. And once on the board, can make most servers penetrable. The tempo hit that you will take from installing this will give a big scoring window to the Corp. Against glacier style decks like typical Haas-Bioroid: Engineering the Future, Blue Sun: Powering the Future and Jinteki: Replicating Perfection this is not as big of a deal as you are both playing a long game and will most likely benefit you the most in the long run. However, against fast advance decks, this tempo hit very well may give the Corp a chance to score their first AstroScript Pilot Program. After this, they are not going to be playing their agendas in remote servers, they will be scoring them out of hand so bypassing ICE is not as big of a deal. Also, kill decks which rely on being ahead economy-wise will take advantage of your low credit pool after this install by putting agendas in open remotes for you to either steal or them to score. With the former you might be hit with a Midseason Replacements or a SEA Source and subsequent meat damage. The latter meaning they can just score 7 agenda points for the win. This card seems to make your more favourable matchups better but your unfavourable matchups worse. This card will not be a typical include in tier 1 decks while fast advance and kill decks are in the top tier for Corp decks. IMO the most powerful console in the game the ability to bypass an ICE is Incredibly powerful see Femme Fatale this gives you that ability but on any ICE once per turn. with a link of 5 this will most likely be free to bypass on top of that but even with only 2-3 link it's more than likely to only cost you 3-2 credits. It's not that it's not got it's down sides however you gonna need some good econ for this thing as it's got a high install cost and the corp is likely to pump the trace if your poor but if your sitting their with a pile of money they won't do a thing. Theirs also cards that works with the console Power Tap,Data Leak Reversal, Account Siphon & Jak Sinclair (tho that's more Jak needing the console). Data Leak Reversal & Account Siphon are IMO the best of these as they work by putting the corp into a lose lose situation. For instance you Account Siphon and use Nexus to get in do they now spend all their money to keep you out or let you in where you then steal all their money either way they end up poor. Data Leak Reversal works in a similar fashion you run use nexus now they can pump the trace to keep you out but then they get milled and you remove the tag last click or they don't pump let you in and it cost you nothing. or if your links low enough you get the tag and mill them anyway, this approach also works well with Jak Sinclair as now you can do the run click-less. It works well for the 1 link shaper runners thanks to Rabbit Hole been a thing. But I feel it's most notable in Nasir Meidan: Cyber Explorer where you can use the console to bypass you own ability or trigger your ability first then use the free money for the trace. This card has the potential to be a monster of a card. Depending on how your deck is set up to deal with tags (Float them or Adjusted Chronotype/ Qianju PT, or other method of choice ) it will allow you to face check ICE with impuninty giving you free access or costing the Corp a lot of credits to Rez things, then (If) your link is big enough, you can just end up ignoring the ICE anyway (Including annoying "on Encounter" abilities such as the Credit loss from Tollbooth or Auto tag from Data Raven.